This is the moment a single mother takes a celebratory selfie outside a courthouse - after she avoided jail over a nightclub glassing attack which left a builder requiring plastic surgery. 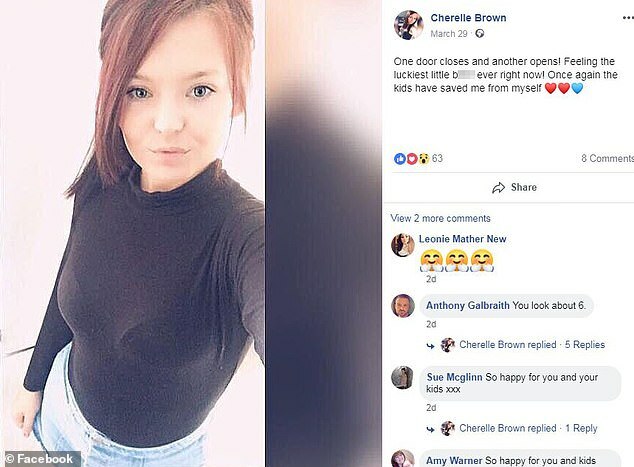 Minutes earlier Brown had successfully begged a judge not to lock her up claiming she was 'regretful and remorseful' for throwing a bottle in Samuel Litherland's face in a drunken rage. 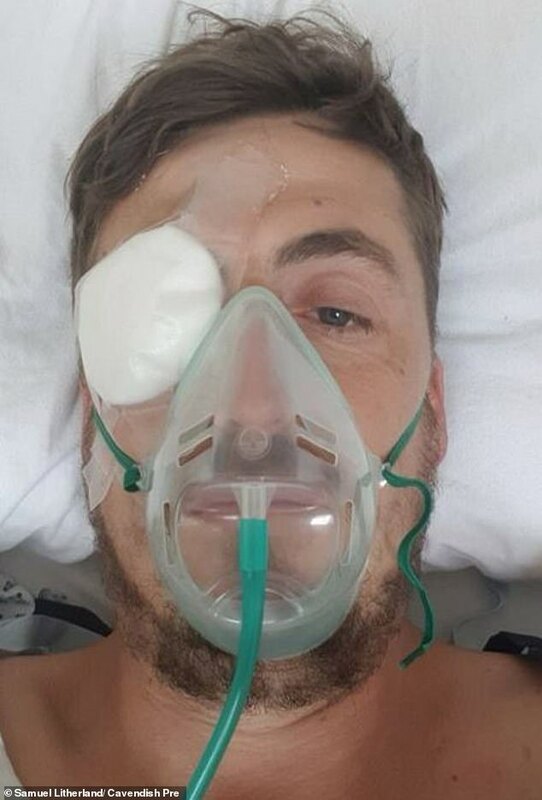 Mr Litherland suffered a cut to his eyelid and was left with his face covered in blood after the lager bottle hit him during a confrontation at the former Switch venue in Blackburn, Lancashire. The victim suffered a 8mm laceration to the lower left eyelid but escaped being blinded in the assault. It is thought there had been 'bad blood' between the pair over a relationship Brown had with one of Mr Litherland's workmates. 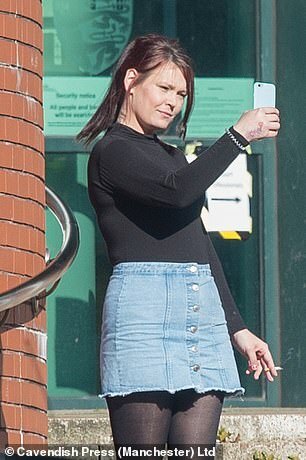 At Preston Crown Court, Brown, of Blackburn, admitted unlawful wounding but said a stretch in jail would be 'disruptive' for her three children, one a boy and the other two girls aged four and 18 months. The incident occurred on May 27 last year after Mr Litherland encountered Brown during a night out. When she initially saw Mr Litherland at the nightclub, Brown threw a drink over him and had to be ushered away. However when she returned moments later, CCTV footage captured the moment she throws a glass or bottle at his face. Peter Barr prosecuting said: 'It was clear that the defendant had two bottles in her hand when she came back out from the club toilet and a confrontation starts between the defendant and the victim. 'One of the bottles is raised by the defendant and she flicks the contents of that bottle over Samuel Litherland. Liquid can be seen coming out of the bottle onto Mr Litherland. 'The defendant then discards that first bottle by letting it drop onto the floor. The second bottle at this point is in her left hand and again she doesn't do anything with the bottle. 'The defendant then punches Mr Litherland with her right hand whilst holding the bottle in her left. 'All this time, whilst holding the other bottle, she could have done something with that other bottle. She could have hit him with the bottle she could have stabbed him with the bottle. However, she just punched him.